Since its inception in 2015, the first generation of the Jeep Renegade has been a popular choice for SUV drivers. The new 2019 Jeep Renegade boasts a few changes for the model year but otherwise sticks to the formula used on the previous model year's line-up. 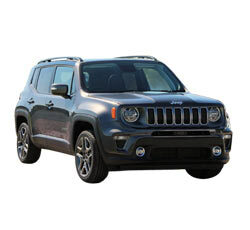 While the Renegade does not offer a ton of leg room in the rear seat and lets in a good amount of wind noise on the highway, it offers great off-roading capabilities and technology that is extremely user-friendly. Most aspects of the 2019 Jeep Renegade cross over from the 2018 model year. However, a few exterior changes have been made in terms of styling (including a more contemporary-looking grille), and the interior has also received updates to make it more functional. Additionally, more features have been made available on this year's line-up. The Trailhawk trim is usually a best-seller among Jeep lovers since it offers outstanding off-roading capabilities. The Trailhawk trim on the 2019 Jeep Renegade is no exception to this rule. The Trailhawk is powered by a standard 2.4-L engine that delivers 180 hp and has four-wheel capabilities. The Select Train Traction Management System easily allows drivers to switch between road condition settings (auto, snow, mud, and sand), and there is a rock setting that comes in handy while off-roading on rockier surfaces. There is no denying the fact that the Renegade has serious external appeal. This vehicle hearkens back to the look of the classic Jeep that many have come to love. While the new Renegade features some chic contemporary upgrades to the front fascia, the boxy shape of the vehicle retains that old Jeep vibe. Even though looks really should not matter, Jeep fans will likely find themselves appreciating this throwback style with an updated twist. Regardless of which trim level you buy, the 2019 Jeep Renegade handles well on paved road surfaces. Even the off-road rated trims offer well-mannered on-road handling. The Latitude trim offers the best balance of off-roading capabilities and on-the-pavement agility and security. Overall, the Jeep Renegade delivers a surprisingly engaging handling performance while on the pavement. A lot of the Jeep Renegade's competitors struggle to offer technology that is easy for all types of drivers to use. However, the Jeep's Uconnect system is entirely user-friendly. The touchscreen display has graphics that are clear and easy to read, and browsing through menu options is simple for even non-tech savvy drivers. Additionally, all of the physical knobs and buttons that can be found up front on the center console are well within the driver's reach, are clearly labeled, and take little effort to get used to. One of the biggest strengths of the 2019 Jeep Renegade is its solid braking abilities. The brake pedal has just the right amount of firmness and does not feel like it has far to travel down to the floor when pressed upon. Drivers can also take comfort in the fact that the Jeep Renegade has one of the best-in-class emergency stopping distances in its class. The numerous driver aids that assist in emergency braking situations add that much more security to the brakes' overall performance. Finding a vehicle that is geared toward off-roading and that has comfortable seats is somewhat uncommon in this segment. The Renegade manages to defy this standard. Seating throughout the vehicle is comfy even though there is a lack of space in the rear seats. The seats can be adjusted a number of different ways in order to maximize comfort, and they are already well-bolstered. The cloth upholstery has a soft and plush feel to it that is bound to be enjoyable during long trips or while off-roading. Getting in and out of the 2019 Jeep Renegade is easy for many people. In fact, those who struggle with mobility issues or who have trouble ducking in and out of low-sitting sedans will appreciate the fact that the Jeep Renegade sits at a not-too-high and not-too-low distance from the ground. Also, the rear doors are shaped in such a way that they leave enough room for getting your head in without hitting it on the upper part of door frame. The doors swing wide for easy access, reaching out at about a 90-degree angle. The 2019 Jeep Renegade hosts multiple standard safety features that were previously optional or only available on higher trim levels. For this model year, both Intelligent Speed Assist with Traffic Sign Recognition and Lane Sense Departure Warning Plus come standard across the line-up. This comes in addition to other optional safety features such as blind-spot monitoring, full-speed forward collision warning with active braking, and the ParkSense Rear Parking Assist System. While visibility on the Jeep Renegade is not flawless, it is pretty good considering the way the vehicle is shaped. The forward view is broad thanks to the wide and almost totally upright windshield design. A standard rear-view camera aids in seeing through the rear windshield, and the Renegade's large mirrors allow the driver to get a good glimpse from the sides. Blind-spot monitoring and the lane departure warning system do even more to aid in rear and side visibility. All but the Trailhawk trim do a great job of absorbing shocks from bumps and dips in the road. In a segment that is populated by vehicles that offer ride qualities that border on the firmer side, getting so much comfort from the Renegade's ride is rather remarkable and enjoyable. Drivers will likely have a difficult time finding a small crossover SUV that mixes ride comfort with a fun off-roading experience. One of the biggest drawbacks to driving the 2019 Jeep Renegade is that the 9-speed automatic transmission has a clunky, sloth-like feeling to it. If you want to drive aggressively, the 9-speed might seem to become confused by this. Also, while entering onto the highway, downshifting becomes significantly slowed down regardless of how carefully or aggressively you are driving. Overall, this puts a real damper on everyday driving performance capabilities. Although the physical design of the Jeep Renegade looks cool and is a nice throwback to the original Jeep style, it has its downfalls. In particular, the boxy shape of the Renegade allows a lot of wind noise into the cabin while driving at high speeds. If you opt to add the My Sky roof, this will let in even more noise. It should also be noted that some trim levels (such as the Trailhawk) are naturally louder than others. This type of disruption might end up being a deal-breaker for drivers who crave peace and quiet throughout the cabin at all times. Another design-related pitfall to the 2019 Jeep Renegade is the fact that there is very little space to be found in the rear seat. Taller adults will struggle to find enough room for their legs back there. If the front seats are moved back too far, rear seat passengers will feel like their comfort is being infringed upon. Also, the limited space in the rear can make it more difficult to fit a rear-facing child seat in the back. While the Jeep Renegade's fuel economy is not awful, it sits fairly low among the pack and is left in the dust by some top competitors in its segment. At best, you can get a combined 26 mpg (24 mpg city/31 mpg highway) from the 1.4-L 4-cylinder engine with the manual 6-speed transmission. The 2WD 2.4-L 4-cylinder does slightly worse at 25 combined mpg (22 mpg city/30 mpg highway), and the 4WD gets 24 combined mpg (21 mpg city/29 mpg highway). The 2019 Subaru Crosstrek is a top competitor for the 2019 Jeep Renegade thanks to its standard all-wheel drive. It also has a high ground clearance that gives the Crosstrek some strong off-roading capabilities that rival those on the Renegade. While handling is not the most precise and acceleration is an issue on the highway, the Crosstrek is particularly spacious for a vehicle in this segment. It also offers a relaxing ride quality and does not let in as much road noise as the Renegade. The 2019 Honda HR-V is another top competitor since it offers an abundance of interior space and handling that cannot be matched by other vehicles in this class. However, the HR-V does not offer a manual transmission option, and its available powertrain seems rather weak. The 2019 Jeep Renegade does not have a flawless drive performance, but it can certainly be used as a capable off-roader. It packs in plenty of seat comfort and has technology that caters to all levels of tech users. Jeep's focus on safety is obvious, and the brakes show refinement that is difficult to find in its segment.